Work continues on the sword knight. There’s a lot of infrastructure that has to be setup, including lots and lots of assets and animations, which is time consuming. Currently, all I’ve got is a dismembered knight who can look right. I should have something more impressive later today. Progress continues, animations are as always pretty time consuming. Thought this buggy loop looked funny though. I’ve now got all the basic logic for the sword knight going. Obviously, I haven’t actually got the knight moving yet – that shouldn’t be too tricky. But first I’ve got to define all the hitmaps for the various pieces (the knight is modeled as five entities: feet, body, head, sword, and shield), or bad things will happen when the knight starts walking into things – and that’s going to take a bit of time. After that I need to make the knight not blind, right now it can’t actually find anything when searching. 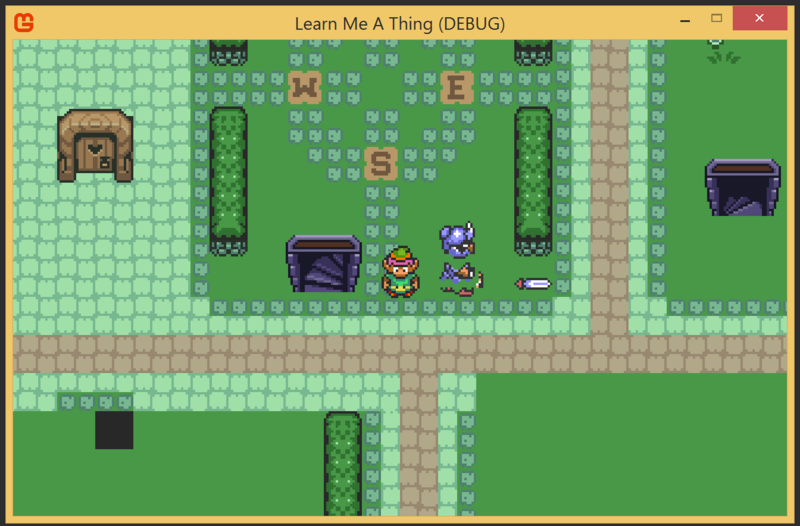 Fixing that will require a temporary entity, and a new state where the knight chases the player. And then finally, I can implement behavior for when the knight’s sword hits a player and the player sword hit’s a knight (or the knight’s shield). With my time running out, I don’t know if I’ll be able to do all of these but I’m going to make an honest attempt. End of the day, and the sword knight can move and has hitmaps for all his components. It’s collision logic is mostly working, though there are no programmed behaviors for such collisions yet. There’s also no bounds checking to make sure the knight doesn’t just wander off the map. The knight is thoroughly exercising all the patterns I’ve built up, and I can see plenty of places I’d make improvements – but there’s no time for it. One thing I did do was create an AssociatedEntityComponent that makes it easy to group entities together, an idea I’ve been putting off (it does complicate the EntityManager class) but keeping track of the 5 different entities making up a sword knight made it necessary. Currently the SwordKnightSystem is 861 lines of code, it’s chunk of the ObjectCreator is 612, and the SwordKnightStateComponent is 74. Lots of code is spent dealing with error cases, and there’s lots of room to improve the ergonomics of the code… but all told, I’m not too displeased with current state of things. I’m going to return to the sword knight tomorrow, hopefully wrapping it up.